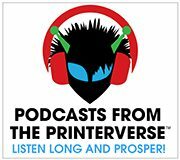 #UKvUSA: What Printshop Investments Attract New Customers? Please do leave comments and if you happen to support one side over the other let us know on either blog! I am proudly representing TEAM USA, and we are using #UKvUSA on Twitter. LET THE DUEL COMMENCE! I am going to skip over the usual suspects here – equipment, technology, communication tools, Scodix (sorry, I can’t control myself) and go straight to what I think is the most important investment any company makes – their employees. Let’s talk in reality. Perception is reality. And my perception might be different than yours, and that is fine, as long as you acknowledge my perception is my reality if you are trying to sell to me. That includes matching the correct salesperson to the correct account, and even within an account, the correct salesperson to the correct buyer if there is more than one. Over the years I have had too many salespeople call on me that might have been fantastic, but they just didn’t fit in with the “agency” culture. That is a polite way of saying they were old… well older than someone you would automatically expect is up on the latest technologies. On the flip side, someone too young isn’t trusted to know anything, let alone be entrusted to the national brand account you are working on. Unless you have a sales force comprised of only 30/40 something’s, you might just be leaving business on the table. My thought here is to invest in creating a team that represents all three groups, and use them for prospecting. Potential clients can see all levels of experience and knowledge are represented, and when it comes time to servicing the account, the best option for the client can take lead. Send the “Jr” to the agencies, send the senior manager to the more corporatey clients, send the mid-level to all as needed, but primarily have them generate new sales calls since they can speak to, and fit in, with everyone. The team shares in all account work and commissions in a manner that reflects their value and experience, and succeeds or fails together. Since I invoked the reality word, let me get back to that. If you cannot create this dream team, printshop owners should evaluate if the correct salespeople are calling upon the correct customers – regardless of anything else. People get set in their ways, they make decisions on what to sell or not to sell based on comfort and not rocking the boat. But there just may be more work you could be doing for a client if a fresh face, of any age, got in front of them. Invest some thought into this. Invest some time learning why prospects don’t become customers. Invest a few bucks on a few lunches and meet with your key customers to find out what they think about their reps, your service, and how your company could do more for them. Understand their reality, and invest in making it yours too. Have you had the “wrong” salesperson call on you? Why were they wrong, and what was the outcome? Next Month’s Duel: How can you connect with print buyers on social media?